John and Pam Pare weren’t home when Hurricane Charlie buried their Orlando home under a massive oak, but reality sank in quickly. The family had gone away for the weekend, and never spent another night in the home they had owned since 1996. As they considered whether to move or replace their home, Pare, at that time Senior Vice President and General Counsel of Hughes Supply, Inc., thought his connections to the construction materials supplier could help. “Between the access to materials, and the connections to various sub-contractors, I thought we would be able to repair or replace the house in short order. Pam and I began to talk about what we should do, and it was then that we set our sights on something a little different. Their “little difference” has turned out to be a historical first in the State of Florida. Their new home is the first in Florida to achieve Silver certification through the U.S. Green Building Council’s LEED rating system. The U.S. Green Building Council’s LEED Program, for Leadership in Energy and Environmental Design, is a rating system applied to environmentally-friendly construction projects. Designed by Atlanta architect Dagmar Epsten of The Epsten Group and constructed by Ken Ritter of Classic Construction, it was completed September 28, 2007. Epsten brought LEED-certification experience from her commercial design practice, including the $40 million, 248,000 square foot, Silver-certified Management Building for the Georgia Institute of Technology. From an architectural perspective, it is equally important that we create buildings that are visually appealing and that work for their owners. This home can be looked to as an example of how average people can live in a structure that is functional and beautiful, yet has far less an environmental impact than conventional construction. LEED for Homes ratings are certified by accredited Program Providers. The Program Provider for this project was the Florida Solar Energy Center, or FSEC, a Research Institute of the University of Central Florida. The FSEC’s Eric Martin reviewed the project throughout the construction phase, and ensured it met all requirements of the U.S. Green Building Council’s program. 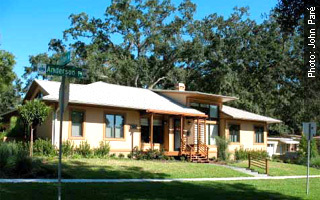 Before this, there had been only one other home to achieve even a basic LEED rating in Florida. The Pare home has now achieved a Silver rating, and did so by a comfortable margin. John and Pam were committed to making this happen, and have proven that eco-friendly can also be beautiful and highly functional. We are very pleased to have been a part of the project. David Bessette, of AllSolar Service Company, consulted on the energy-efficiency and climate-control in the residence, one of the most energy-consuming aspects of residential buildings in Florida. With respect to energy consumption, the solar water heating system was the single best measure they incorporated into the home,” said Bessette. From a climate-control perspective, the Pare’s have built one of the tightest homes, if not THE tightest home, in the state. In the 30 years that I have been in this industry, I have not seen a residential building envelope as efficient as was achieved here. According to builder Ken Ritter, “We were originally approached because of our expertise with Eco-Block poured concrete wall systems. When Mrs. Pare and I talked in-depth, we realized we shared an interest in incorporating a number of eco-friendly design concepts in the building. As the general contractor, we are very pleased to be responsible for this milestone in LEED certification in the state, and plan to continue to add eco-friendly elements to future projects. Pare had this to say about the family’s green project: People make choices every day that, collectively, have dramatic impacts on the environment. I believe that if we make some simple, conservative choices about how we use our environment, we can live comfortably today, and preserve the planet for tomorrow. Our hats off to the Pares.